I am not sure how much the news is highlighting the Queen's Jubilee this weekend in the States, it seems to be all over CNN.com and working with an English girl, I coudln't forget it was coming up. Turns out, my workmate, Holly, got a surprise box on Friday - a box full of things to celebrate the Jubilee! Her lovely sister had sent her the box with all the fixings for a lovely little party, like as if she were in England - masks of the Royal Family, Union Jack tissues and even a Jubilee cookbook! Holly, very excited, posted the photo of the box of surprises on Facebook and soon after I suggested we wear the masks out to a bar to celebrate Queenie's day. She upped the anty and suggested a lunch at her place where she would cook treats from her Jubilee cookbook and us girls could have the boys there too so that they could wear the masks and celebrate her Majesty too! Joseba and I arrived dressed in British colors and ready to celebrate Elizabeth's 60 years! Since Holly was throwing the party, we let her be the Queen, which meant her husband would be Phillip, which just left me with Kate Middleton and my hubby as Willy. 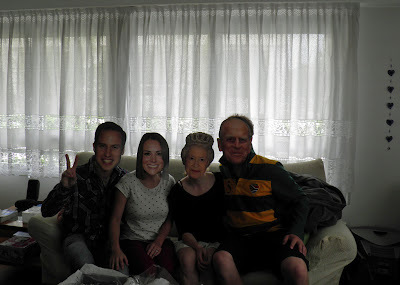 I found it a bit funny that although Charles was in the box, Camilla didn't make the cut. Turns out us Americans aren't the only ones who don't like her! Having read a bit online, it seems that this day is one that will go down in history in England - massive boat parades, horse-drawn carriages, people caming around London to get a peek of the Queen as she celebrates so many years as the head monarch. The national spirit seems to be so high, and hearing Holly talk about it, you can tell that she kind of wants to be there. It may be silly, celebrating the Queen's Day with masks and little picnic treats, but I completely understand what it is like to miss your country on special days like this. The only day in the whole time I have been over here that I really wish I had been home was the day at Barack got elected. For the States it was such a big event, one for the history books, and I missed it. I think that for my generation it will be one of those days that you will remember what you were doing when it was announced that he would be the next President. Or where you were when he gave his inauguration speech. I was teaching 3 children, Maria, Nestór and Jon, and remember being so sad I was missing such a special event. So hopefully, when Holly looks back on her missing the Diamond Jubilee, she will remember dining on her tasty salads (one with garlicy tomatoes, one with yummy potatoes and one with duck - all equally delish), nachos and her sausages in little flaky crusts. And while she didn't have the Union Jack toppings for her cupcakes, the Buckingham Palace guards that marched around her cupcake wrappers did the trick.